In my first year at high school (1973) their was a concert at our school by a Dutch rock’n’roll band called Long Tall Ernie & The Shakers. It was my first concert and I was impressed by the noise. I felt many hormones being released in my bloodstream, but I didn’t really understand was I was seeing and hearing. This band could play; they sounded just as good as the bands I had heard on records and on radio. But I didn’t know any of their songs and most of all I was confused by the concept of a life concert . After you have seen a few hundred bands, like most of the people my age have, you forget that that there are many aspects of a life concert that you take for granted, but that you have learned somewhere. After the concert I wondered if these guys were famous. Were they full time musicians? Did they have families? So far i had supposed that my private world and the mysterious universe, where all my music came from, were separate. But now, for the first time, I realised that these two were not really separate. I remember that I also realised that the artists, whose records I bought, were probably also playing at places like my high school, just like Long Tall Ernie & The Shakers, and that I even might be able to see some of my favourite bands life one day! This was a very exciting thought. 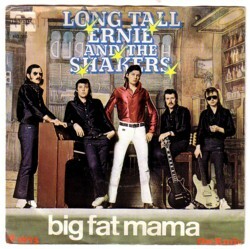 The next week I went to a record store and asked for a record by Long Tall Ernie & The Shakers. I guess that had told they had a single out, but I cannot remember that. To my surprise the store had one: Big fat mama. 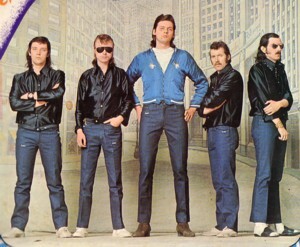 The song became a minor hit a few weeks later. I remember the strange feeling I got from the realisation that I had heard the song life on stage before i heard it on a record. I could not quite get my head around this fact. Yesterday I bought a better copy of the Long Tall Ernie’s Greatest Hits LP, that was released a bit later. I cannot remember that any of the other songs on this LP ever hit the charts. Long Tall Ernie did have a few hits later in his career and he made one of the best Dutch disco LP’s in the early eighties. But that is an whole other story.